Microsoft may be lining up a revision to the Xbox One controller. 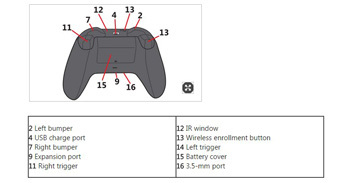 Eurogamer spotted a change to the "Get to know your Xbox One Wireless Controller" page on the Xbox Support website which indicates the presence of a 3.5-mm port on the bottom of the controller's feature diagram. The page (since reverted to its prior state) indicated that this port is only present in controllers released after June 2015. The currently available Xbox One controller has no such port, though it is possible to add one with an accessory, the Xbox One Stereo Headset Adapter. The description of the new port states that it is intended for "compatible 3.5-mm audio devices." Some brands of third-party headsets, notably those which meet "Made For iPhone" (or "MFi") specifications, are not fully compatible with the existing Xbox One Stereo Adapter, rendering their microphones useless for chat without a workaround. It is unknown if the presumed controller revision might address this issue. If Microsoft is going to unveil an updated controller (and do it in such a way that has those controllers in stores next month), they will almost certainly be doing so as part of their Xbox E3 2015 Briefing event. That takes place June 15, starting at 12:30pm EDT.